Wall tiling- all the information you need before getting started. You can take on the job yourself or hire us to take care of it for you. If you have any additional questions don’t hesitate to contact us. Tiles can be fixed to most walls. Before you start wall tiling the surface must be properly prepared. It should be suitably level, dry, and free of dust, grease or any loose material. All surfaces must be completely secure and capable of carrying the extra load. Special care must be taken when tiling areas which may become damp or wet. Our tanking system should be used in these areas. Please ask our sales staff for advice. New plaster should be allowed to dry for at least four weeks before tiling. All plaster surfaces should be primed with acrylic primer and left to dry before tiling. Plasterboard can be tiled over once it is firmly braced and fixed. Check for any bulging or sinking in the boards. Make sure the lips between boards are flush. Plasterboard must be primed with acrylic primer and left to dry before tiling. Timber should be WBP plywood. All timber must be dry, firmly braced and fixed. There should be no bulging or sinking in any of the boards. Seal the back, front, and edges of the timber with primer. It is important to prime the back and the edges of the boards. Particularly in a wet area this avoids the boards swelling and warping due to water ingress. The primer must be completely dry before tiling. Tiles often provide a good base for tiling as long as they are flat and in good condition. Make sure they are completely clean and firmly fixed to the wall. Any damaged or loose areas should be repaired. Check what kind of surface the existing tiles are fixed too. It will have to take the weight of the new tiles you are adding on top. Apply P4 Ardex Primer 24 hours before tiling. This surface primer forms a key for the tile adhesive to bond to. render must be at least 14 days old or suitably dry, before tiling. Dusty surfaces must be thoroughly dry brushed. Porous renders must be primed with acrylic primer and left to dry before tiling. Wall tiling directly onto bricks and blocks is possible. However they must be flat enough to receive the tiled finish. Block-work must be primed with acrylic primer and left to dry before tiling. JMR does not recommend tiling onto papered and painted surfaces. These should be completely removed. Where paint cannot be completely removed, the paint should be heavily scored. 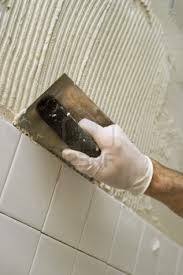 Use a sharp stanley knife or other sharp object to expose as much bare plaster as possible. After scoring, any chipping or loose paint should be completely removed with a paint scraper. The surface should then be primed with acrylic primer and left to dry before tiling. Extra care must be exercised when tiling domestic showers. 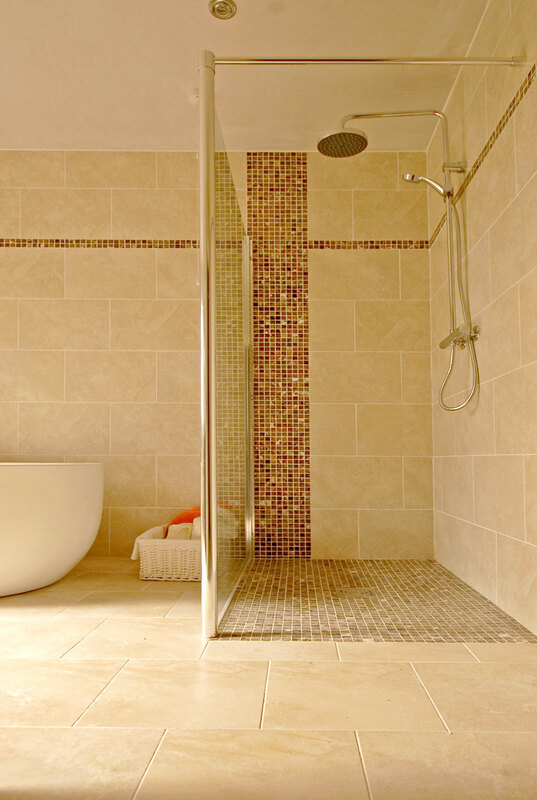 Showers should not be used for at least 14 days after tiling. We recommend that all showers be tanked prior to tiling using our recommended tanking/shower proofing system. Its’s best to mix up the tiles as you fit them. Many ranges have variations in pattern to create a natural look. Mixing up the tiles helps to create a random pattern. Its tempting to save money by getting cheap or unsuitable adhesive or grout. Don’t! People go to the trouble of buying high quality tiles that will last for years and years. The adhesive wont ever be seen and is often seen as an easy place to cut back. We often get called on to re-do a job after somebody else. We have had countless customers whose tiles are falling off the wall. The tiles are usually not re-useable, with the old adhesive stuck to the back of the tile. Its not worth the risk and cost of having to re-tile your bathroom. Your tiles are only as good as the adhesive underneath them. 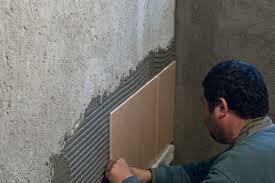 You should use wall tile adhesive that is cement based and flexible. It should also be water resistant. Call in to us in Mallow, North Cork were we carry a full range of grouts and adhesives for all surface conditions and tile types. We keep our prices low without stocking cheap unsuitable products. Carefully follow the mixing instructions on the back of the adhesive bag. Don’t mix more than you can use before it sets. Keep in mind that adhesive sets faster in warmer weather. Before beginning wall tiling it is important to plan ahead. You want to end up with the top and bottom row of tiles on the wall being the same size. You don’t want a full tile on the bottom with only a small sliver of cut tile on the top. This can happen when you start tiling from the ground with a full tile. After you have worked out the size of the top and bottom cut you are ready to begin. For now leave the bottom row of tiles off. Instead fix a timber batten to the walls as support for the 2nd row of tiles to sit on. We recommend using a 6mm-8mm trowel when wall tiling. Spread only enough adhesive that remains workable. We would recommend an area of approximately 1 square meter. The adhesive should completely cover the area. A layer between 2-6mm thick should be applied. Place the 1st tile in the corner formed by the timber battens. Push the tile home firmly with a slight twisting action. Place the 2nd tile next to the first, using spacers to allow for a grout joint. Continue on, sideways and upwards over the prepared area. Ensure your tiles are installed flat and level. Complete the wall using whole tiles and allow the adhesive to set. Now remove the timber battens and tile the top and bottom rows with cut tiles. Watch this video to see how batons are used for wall tiling. Some glass tiles can be very transparent. Because of this there are important extra steps to follow. There can be no gaps in the adhesive coverage behind the glass. Otherwise any colour difference between the adhesive and the wall behind it would effect the finished look. Using a 4mm notched trowel, spread the adhesive onto the wall. Use firm pressure to make sure of good contact and that a uniform coat is applied. The tiles can now be pressed firmly into the adhesive. With mosaics it is important that individual sheets can not be distinguished. Using a flat grouting trowel tap the mosaic into place. This will give an even finish to the face of the mosaic. Make sure that the gaps in the mosaic are not filled with adhesive. It is essential to wear suitable protective clothing and goggles when cutting tiles. 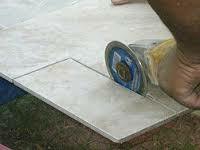 Tiles can be cut using a standard tile cutter or an angle grinder. Use an angle grinder when the cut needed is not a straight line or the tile material is too hard to cut in a tile cutter. Porcelain tiles require high quality diamond blades for cutting. When using an angle grinder, mark the tile where you wish to cut it. Run the cutting disc along the marked surface cutting the tile to at least two thirds of its depth. The tile can then be snapped. Rough edges and chips should be smoothed and finished with a sanding block. Check out the grouting section of our floor tiling page for all grouting information. We carry all primers, adhesives, grouts and sealers to complete any job in stock. For any other issues or queries about wall tiling call into our premises in Mallow, Co. Cork. Our experienced staff will be able to address any issues you have aswell as arrange fitting if needed.